I'm new on this forum. First of all sorry for my english I'm going to upgrade my F5VL Notebook from T2330 to T9300. I've already bought processor, but after fitting it into socket computer starts but there's only black screen. I have NB SIS 671/FX/DX/MX Rev. 00 and SB SIS 968 Rev. 01 . BIOS is AMI ver. 213 from 12/25/2007. I couldn't find any cpu support list for this notebook. Is there something I can do about it? Please help me. On some polish forum it is sad that in x50sl on BIOS 308 Penryn cpu are working, T8300 for sure. My BIOS is old, so could someone modify it, or tell my which processors are compatible with my asus? I added to your bios laptop CPU microcode for t9300. Maybe this will work. Officially F5VL doesnt support t9300 but it wont hurt if you try with my modded bios. Please remember you do it on your own risk. try finding them in the Internet using their CPU ID. Could someone tell me if processors on P 800MHz will work for example T7500 SLA44? T7500 should work. Look for all of them in cpu-world site. But there aren't any cpu on socket P core 2 duo with fsb 667 there are only 800? Chipset supports 533/667/800/10xx. Will it work? T7250 Cpu works, so FSB 800 MHz is no Problem. But it has to be a Merom-Core, the 'newer' Penryn-Core based Core 2 Duo Mobiles (like T9300) don't work. So you think that t7500 cpu should work? Raalphs mod above only included 1 microcode entry for 0676 when there are actually 5. 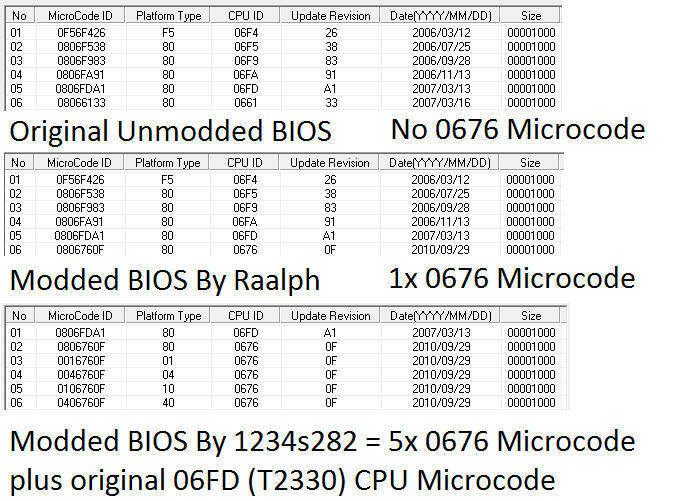 Due to a size limit on the amount of free space and microcode that can be put into this BIOS , i have had to remove microcodes for 06F5,06F9,06FA. If the mod doesn't work with the T9300 , this BIOS still has the 06FD Microcode required for your original T2330 to work.